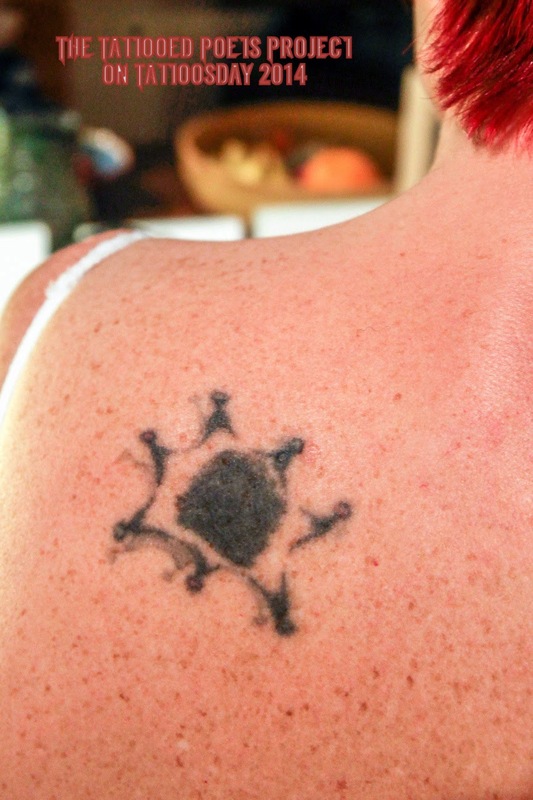 "My Tattoo is about 20 years old and has lost a lot of its luster and definition from too many years under the sun’s glare. In case you can’t make out what it is, it is a representation of a thumbprint (mine actually) and it sits on the place on my back where all my tension resides – very good for showing people where to massage! The back story is that before I was born my father lost the first section of his index finger in an industry accident and they took out the bone and used the empty skin with his fingerprint on to seal the wound, so his fingerprint was on the back of his finger. I took the idea of this, plus the idea of Japanese tattoo artists getting the skin of their clients after they die, and imagined my thumb print skinned, stretched and pinned to my back. It was made by Daemon Rowanchilde at Urban Primitive in Toronto, Canada – I think I was one of his early clients – but in no way does it do his work justice. [Click through artist and shop name for further reference.]" - will every role turn inside out? Jill Battson is an internationally published poet and poetry activist who is Poet Laureate Emeritus of Cobourg, Ontario. She was responsible for creating and running the successful poetry reading series The Poets’ Refuge and has initiated and produced many poetry events including The Poetry Express – a BYOV at Toronto’s Fringe Festival; Liminal Sisters – a language poetry event; The Festival of the Spoken Word – a five day spoken word festival; Fightin’ Words – poets in a boxing ring; The Poetburo Slams and the hyper-successful Word Up – a series of interstitial poetry spots airing on MuchMusic and Bravo! which spawned a CD with Virgin Records and an anthology with Key Porter. She was the poetry editor for Insomniac Press from 1999 to 2001. Jill is widely published across North America and the UK. Her first book, Hard Candy, was received to great acclaim and nominated for the Gerald Lampert Award. She has written several plays and solo works, including How I learned to live with obsession as well as Ecce Homo and Hard Candy – enhanced monologues for dance and voice. Jill has written the libretti for two short operas, Netsuke and Ashlike on the Cradle of the Wind, produced by Tapestry New Opera Works, and produced an electro acoustic sound art project, LinguaElastic, as part of the Canadian Music Centre’s New Music in New Places series. Dark Star Requiem, for which she wrote the libretto, premiered at Toronto’s Luminato Festival in June 2010. Her new project, Sleeptalker, will soon appear on stage. Jill’s third book of poems, Dark Star Requiem, was recently published by Folded & Gathered Press. Her new book, The Ecstatic Torture of Gratitude, has just been published by Guernica Editions. Gratitude Songs – a CD of selected poems set to music – is available as a free download from Bandcamp. Thanks to Jill for sharing her tattoo and poem with us here on Tattoosday!